There are different ways of understanding art. On the one hand is value of the form, going quite literally on what the artwork is. On the other is emotional perception: how an artwork makes us feel. There’s not a right or wrong way, it’s more like a sliding scale, with different artists dotted along, working at different points. Even this isn’t concrete: I might judge an artist in a completely different way to you. Whilst I understand that Jaques-Louis David wanted to stir patriotic emotions in The Oath of the Horatii, for example, I can’t help but prioritise its formal qualities when I view it. You might feel the same about one of my “emotional” big-hitters, such as Harmony in Red. This gets even more complicated when we come to more abstract works, with the debate which has constantly simmered about their form. It’s thing which brings me to Yves Klein. I write this blog for those of you who are maybe curious about art, but feel like they don’t get it. And if you’re judging an artwork on formal qualities alone, then the opening blocks of pure colour probably won’t do it for you. So I urge, I plead with you, to give it time. Because when you feel it, it’s extraordinary. Klein was interested in everything from spirituality to judo. His main artistic intention was, according to the exhibition’s introduction, to reflect “absolute immateriality and infinite space”. This is important: thinking too much about the shape and form of Klein’s work is to miss the point. He believed that art was about something far more elemental than that. To express this he created his own colour, IKB (International Klein Blue), of which there is of course a lot on display here. One of the keys to this exhibition is just taking the time to experience the colour, and this is possible early on with IKB 79 (1959). Just spend some time with that colour, not focusing on anything in particular apart from getting lost in it. It’s a wonderful, deep blue which brings to mind many places, objects, feelings, and will stay with me for far longer than many other more “conventional” paintings do. Klein couldn’t have created a more perfect colour for expressing “The Void”. Once you recognise the elemental purpose of this colour, everything here falls into place. Take the Anthropometry series. These are the results of a 1960 performance piece in which Klein instructed women to cover themselves in paint and press themselves onto the paper. So what we have, here, are impressions of a moment which will never be the same again – how immaterial. Then there’s the blue again, reflecting the movements as expressions of human freedom. Again it’s easy to focus on the method of composition, but these Anthropometry works are about much more than that. I must give congratulations to the curators for putting together an exhibition that really makes you believe in Klein’s intentions. And at a time where the value of art seems more under scrutiny than ever, the final room is a triumph. 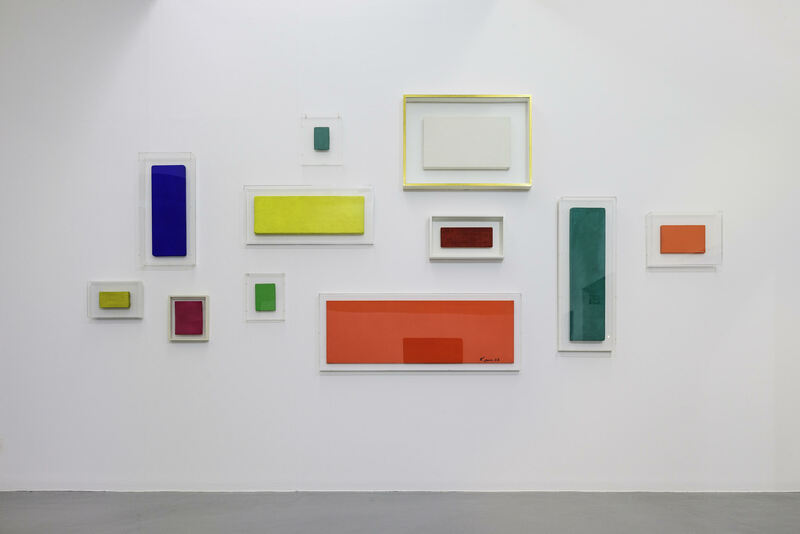 It recalls an exhibition in which Klein exhibited 11 identical blue paintings, each with a different price tag. The intention was twofold: to question the role of the viewer in placing a value on art, and to emphasise how each picture can have it’s own feel. If this sounds absurd, spend some time in this room. Look at how each is framed, hung, how the light falls on it. You will end up with a favourite, I promise (I won’t tell you which one mine was). This is abstract art as the highest form of purity. 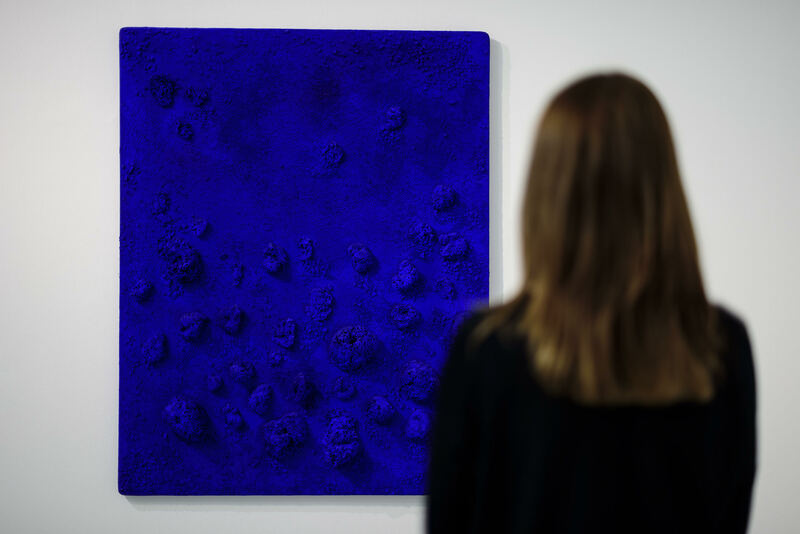 I knew very little about Yves Klein before this show, apart from a few of his works. This show really captures his innovation, exploring what he wanted his art to stand for and how he achieved it. Klein died at just 34, and you can’t help but feel that the art world lost a true visionary. Go and embrace this opportunity to share in that vision. This entry was posted in Exhibitions, Home, Past exhibitions and tagged abstract, art, Art History, blue, colour, elements, France, French, perception, performance, Yves Klein. Bookmark the permalink. ← Let’s Talk About It #9: No space for art?